If cooked properly bear meat can be as good as any venison you've ever eaten. Although, I am of the belief that an animal is what it eats. If you are cooking bear that has been eating carrion (dead animals) in the wild, you might not like how the meat is going to taste. But, if that bear has fed on vegetation and berries the meat will be much tastier. It is not a bad idea to marinate wild game to remove the gamey taste and tenderize the meat. This is not as important for young animals as it is for the older more mature animals. But, I find that the meat always tastes better with a good marinade. It is important to cut off all fat and sinew when cleaning the meat. Bear fat has a very strong flavor and will make the meat objectionable if not completely removed. It is better to remove a little meat than to leave any fat on the meat. Care should also be taken with bear meat to prevent trichinosis. Bear should be cooked "well done"... to an internal temperature of 170 degrees F. Make sure to cool down the meat as soon as possible after cleaning to decrease the chances of spoilage. 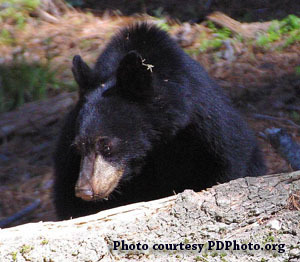 Black bear meat can be a carrier of Trichinella spiralis and Toxoplasma gondii, the parasites that cause the diseases trichinosis and toxoplasmosis in humans. Cooking bear meat properly will ensure that the meat is safe to eat. Similar to pork, the proper cooking time for bear meat is 375 degrees F and it should cook for 20 to 25 minutes per pound. Internal cooking temperature should reach 170 degrees F for 3 minutes or more before consumption. Cook until there is no trace of pink meat or fluid paying close attention to areas around the joints and close to the bone. Freezing meat does not always kill these parasites. I suggest freezing, canning or eating it within a week after it is killed because the flavor becomes stronger as the meat ages. Trim fat from the meat especially well and, as with all meat, good wrapping and sealing is recommended. Vacuum sealing your bear meat is always best.